Sally Malir for Spen 20 Yorkshire Champion. And the Winners were Jacqui Weston and Paul Sugden. Congratulations to them both, they will receive technical running shirts from ROM sponsor UP & RUNNING. From Karen Lambe on behalf of the LS29 Support group... "I'd like to thank everyone for their brilliant fundraising following the Dalesway relay and during last Friday’s Quiz Night (with particular thanks to Jacqui Weston for her inspired champagne game). In all, £155 was raised for the group which supports families with disabled children in the area. The money will pay for several trips during the school holidays including visits to the EST donkey sanctuary and Lineham Farm as well as music sessions." Alison Weston reports ... an ususually fantastic day for the Edale Skyline race in Derbyshire today. Sunny with no wind all day!! 21mile circuit with 4,800 ft. ascent. Henry Heavisides reports ... Despite the minus 2 degree temperature it was a bright still day, good conditions for running a 10k. The course is advertised as being flat (it is by Bradford standards), but it actually has a couple of small hills. 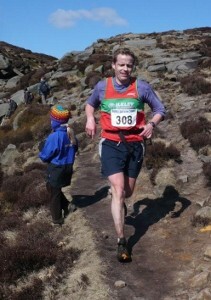 There were several Ilkley Harriers taking part, Justin Phillips was fastest. Andy Wiggins ran a stong 2nd half in his first race for 3 years, overtaking me in the last 100 metres, we finished in 68th & 69th places. I was pleased to do my fastest 10k for more than 25 years and almost 2 minutes faster than the same event last year. Andy Wiggans adds .... I thought my days of hanging around outside gents' lavatories were in the past, but following some starvation dieting and a bit of being ordered about by Mr Wolfenden at the track, I decided I was possibly fit enough to join Vic Verecondi and his unpredictable digestive system at the Epilepsy Action Bradford 10k. After several warm up laps of the town hall, with conveniently located conveniences for Vic to stop off at each time, we were off in perfect conditions. Clearly hoping to emulate the success of Leeds' Abbey Dash this is a well organised affair with a city centre start and finish and a flat (well flattish) out and back traffic-free course. I say flattish as there are a cheeky couple of hills thrown in to keep the runners honest, but these are both on the way out so the second half is decidedly speedy. I saw several Harriers out on the course, and just managed to tip toe past Henry Heavisides at the finish, and rather surprised myself when I checked my watch to find I'd run 39:30. By the time we'd got back to the car we'd received a text confirming our times, which is a new development I've not seen before. Colin Lugton spotted that Liz Price finished in 1.48.01, 3 minutes faster than last year. Val Kerr writes .... To my knowledge only myself and one other Harrier made it over to Coniston on Saturday for the Coniston 14. Despite the forcast for sleet showers the day turned out to be sunny and dry (but very windy), and the scenery, as always, was spectacular with a good cover of snow on the Old Man and surrounding mountains. We were lucky to have the wind behind us on the run down to the turn at the end of the Lake at 6 miles and were also fairly sheltered for most of the time on the far bank on the way back, except for the last 1.5 miles back into Coniston which seemed to be straight into a nice headwind (or perhaps I was just tired by then). Thanks to Terry for his words of encouragement at the top of the hill at 12 miles - it certainly spurred me on to a faster finish and a bit more overtaking than I might otherwise have managed. This is a tough road race (long and very hilly) but is definitely my favourite (this was my 8th attempt), combining a challenging course with beautiful scenery. From Eric Morley ... In good running conditions 1st home for the club was Eric Morley in 50.22 followed by Jim Towers in 53.37, then came Sue Morley in 54.45 and then Lyn Eden making her comeback to racing after injury in a time of 69.48. As always the food after the event was superb. From Colin Lugton ...This is the second year that the event has been held, and has almost doubled in popularity from last year's 300 participants. It uses a multi-terrain course, that links Keighley's four parks, on a mixture of roads, footpaths, ginnels, bollards, steps, rutted fields and cobbles. Now, I understand the need for the two pages route description, which is interspersed with cautions, hazard warnings and safety notes. Hence, it is more of a training run, than a race for a fast time. However, it was well marshalled and policed with extensive road closures, except for the road crossing at 9k, which is controlled by a pelican crossing. The race was dominated by Keighley & Craven A.C., with little representation from the Harriers, but well done to Jacqui & Janet for their good runs on Mother's Day. The added bonus is that the event raises money for Manorlands Hospice, Sue Ryder Care at Oxenhope. From Graham Arthur ... Never heard of it? No, it’s a new Dave Parry race – and does not disappoint, they never do. North York Moors, AM 10.5 miles 2370 ft. So, nice weekend, check calendar on Saturday see if anything is on (itchy feet), looks good, and was. If anyone has never done a Dave Parry race (North York Moors website), he runs winter and summer series of many lengths and styles, up to about AM. You often see Norman Bush there, but apparently he has not been doing them this winter, and was not in evidence today. I was first V60. The only other local bod I recognised was Malcolm Coles (V65), ex Skyrac, now Valley Striders. Graham Breeze noted that Malcolm did about 100 races last year. Another V60 just behind me will be doing his approx. 32nd 3-Peaks this April. Makes you weep. From Alison Bennett ... This race was set amongst beautiful scenery in Ruthin, North Wales. The course comprised two laps of 4 fields which were dry with just a little undulation. For anyone who hasn't done a vet's race, the competition within your age category is obvious as you wear your age group on your back. As the race unfolded, I was running closely with another FV45 and an FV50 lady and we frequently passed each other. However after legging it down a track and turning into a field I concentrated on Pete's "Change of Speed, Change of Direction" and nipped ahead of the FV45. The FV50 was pulling away but I went with her. At the start of the last hill I overtook the FV50 and then we were into the final stretch to the finish. A FV40 lady ahead didn't look as though she was accelerating to the end so as there was nothing to lose by not doing, I managed a final push to overtake her. I was pleased with my 15th place overall, and 6th V45 position. It would be good to try and get a team to this event next year. Steve Turland reports ... Two of us across at Fiendsdale in the Bowland Fells. Navigation would have been a bit tricky but fortunately the mist cleared before the race leaving it bright and sunny. From Alison Weston ... 45 Ilkley Harriers participated in the club relay following the Dalesway from Bowness in Cumbria back to the old bridge in Ilkley. Dave Wilby, Lee Morley and Brian Melia started the relay off from the dark and misty shores of lake Windermere at 5.00 am. The sun started to rise soon after 5.30 am and it was definitely a day to see Cumbria, the Howgills and the Yorkshire Dales at their best in early spring. The route was divided into 13 sections for the relay with at least 3 runners on each leg and many more joining in the later sections along the river Wharfe back to Ilkley. The final runners setting off from Bolton Abbey reached Ilkley at 7.30 pm to be met by lots of Harriers and their families. Almost £100 was raised for a local charity, 'LS29', supporting children with special needs in the area. Colin Lugton adds ... I note from yesterday's Yorkshire Post that Sally Malir was first lady in the Yorkshire Championship. Well done, Sally. From Dave Wilby ... After the fantastic Harriers turnout at the Half Tour of Pendle last week, the calculations have been finalised and the championship standings are out. What an amazing set of results!! Congratulations to everyone involved, I hope this is the start of a special year on the fells, well done. Henry Heavisides reports ... It was good to be back on tarmac after recent muddy cross country races. The flat St. Annes course was harder than I was expecting as a result of a head wind for the 2nd half. Six Ilkley Harriers were running, led home by Neil Chapman, but honours went to the Ladies with Christine Matthews 1st F55 and Jane Bryant 2nd F40. I ran the 2nd half 3 minutes slower than the 1st half, in part reflecting the headwind, but mainly an over enthusiastic start. Congratulations to Christine, who has taken 6 seconds off her club record. From Paul Stephens ... there was a record field for this fell/track/road race around the Ovenden windfarm. 4 Harriers (I think) Lee and Sally Morley, Ian Rowbotham and myself. Unfortunately, some joker had altered the markers, and many people turned right along the road at around the half way point instead of left, including most of the leaders. I hadn't done the race before, and I was lucky. I'd just caught Sally up, and the group in front realised what had happened and went the correct way. We followed. I managed to keep up with Sally for about a mile, but I couldn't on the long downhill, and lost about 6 places. An enjoyable outing and I'm looking forward to the results as they'll flatter me. Lee Morley adds ... having done this race last year I was hoping for a couple of minutes off my time of last year. Unfortunately it seemed a little longer this time (I believe Rowbo thought so too, so I’m not alone!) I finished in about 1hr 10 compared with 42 minutes last year. I think I need to up the training. A really good event, trail / fell with a Pub at start and finish (same pub)- worth looking out for next year. Well done to Paul Sowden who was 38th in 5h15:26, and Amanda Parnaby 217th in 8h19:43, on a very windy Haworth Hobble. From Terry Lonergan ... When the Dent Primary School organisers first conceived of the plan to hold a 14.4 mile road race through the fairly remote but magnificently picturesque Dentdale (10 miles north of Ingleton) they must have had doubts as to its chance of success. But as in the Field Of Dreams film…..remember “If you build it…..he (they) will come”…they decided to put the race on and see. Well they came in past years and they came again in 2009. From London, from Stroud, from Oxford, from Fife, coaches from Oldham and Dumfries; most Lancashire clubs were represented plus of course, Keighley, Skipton etc. 421 runner in total arrived to face the challenge of a tough undulating course, not helped by strong westerly winds which would prove too much for many in the last 3 miles of climb back up to the village. Fortunately, we were spared a repeat of last year’s monsoon conditions. Despite its national appeal, I was the only harrier tempted, finishing 80th, 5th M60 of 46 in the age group. Going through the half marathon in 96+ minutes. Race won by Matt Barnes (Altrincham) 72.53. Jo Waites (Calder Valley)came off the fells to push back Otley’s Josie Hodgetts into 2nd. Nigel Tapper reports... Three Harriers (from an initial expected contingent of at least 5) braved this windy but very runnable trail/fell race. A LDWA event very well organised and similar to the favourite Rombalds Stride covering 25 miles and 3650 feet of ascent around Wharfedale and named after the geographical highlight of Trollers Ghyll (a fantastic rift in the landscape and a challenging climb at the 20 mile point). Refreshments en route provided welcome respite for those who decided to partake of the various quality offerings including ... Hot Dogs at one check point! It's amazing what our bodies can cope with in adversity! The intention was to use the event as a test for the 3P and it did not disappoint as the wind, furious at some points tested us most of the way. This run might be worth consideration for the running league committee as although yes it's a little longer than the Stride, it is actually more runnable and might encourage one or two of the ardent roadies to give this type of event a go. Nice meal at the end in Threshfield and plenty of tea - what more can one ask? Keith Wood (one of my club heroes having encouraged me tremendously in my early club days) was once again ready to give it a go despite niggling injuries and as usual didn't disappoint with his usual gutsy performance finishing in 4.33. Andy Shinn, preparing for London, was a little off his PB pace finishing in an enviable 3.57 and I was happy to arrive in 4.19 tired but not overstretched and generally happy with the effort. Roll on 3P! Ilkley Harriers organised a relay event for 180 children from Wharfedale Primary Schools, at the Nell Bank Centre today. More details on the junior pages. From Malcolm Pickering ... Ten Ilkley Harriers ran in the 5th and final cross country race of the season at Emmanuel College, Bradford. First home for the women's team was Alison Bennett in 2nd place, followed by Sally Pickering 54th and Amanda Parnaby 56th. In the men's race Malcolm Pickering was first Harrier home in 24th place, followed by Kevin Gooch 36th, Henry Heavisides 46th, Ian Marshall 69th, Andy Jackson 94th, Don McRae 108th and Andrew Bennett 111th. Fiona Schneider reports ... Challenging, but very enjoyable.......well supported by the Mountain Rescue Team and the good ladies of the village, who provided excellent post race refreshments. Some good photos on the Woodentops web site. Paul O'Looney's consistently good results have now taken him into the lead in the IH Running League. From Steve Weston ... family connections and FLM training brought me down South for the Berkhampstead Half Marathon. A low tech event - no chips, no goodie bag just half an orange and a cup of water - it was well run and marshalled by the local Rotary Club. An interesting course run through the woodied lanes North of Berkhampstead around Ashridge House. The course included two steady hills on the out and mostly down hill on the way back. Not a PB course the winner came in at 1:12:46 and I came in 49th in 1:26:03. Results from berkhamstedhalfmarathon.co.uk. 30+ Harriers turned out for a lovely race in Golden Acre Park. 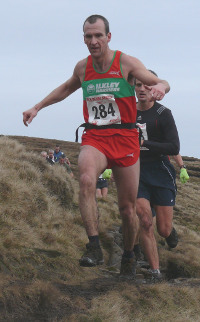 Tom Adams won, scoring 100 points in the Ilkley Harriers Running League. 15 juniors from Ilkley ran too. And thanks to the many supporters around the course! the PECO pages on Abbey's site. Heather Dawe reports on ... 5 hours of navigational mountain biking and running in a great area. The usual suspects were in attendance, along with some Harriers trying out the Open5 for the first time. Sue Bickerdike's great article summarises how much fun she had. I spent most of my run time with Helen Jackson chatting a bit too much. She then proceeded to beat me into second female solo after the bike ride. Hopefully that's everyone, apologies to anyone I have missed. Eddie and Julia are currently leading their category and I mine in the Open5 league. Jacko is bearing down on me fast though! The next and final event of the series is down in the Peak District in April. Rachel Hagan adds ... Don't forget me and Angela Sturgeon - we entered the Open 5 for the first time and had a great time. Even better, we came 6th female pair, which is probably the best result I will ever achieve for the Harriers, so make the most of it!! It was a great event for those keen to combine biking and running while orienteering in fantastic surroundings, and fellow competitors were friendly and encouraging. Funniest moment: coming across Helena - covered head to toe in mud - and Sue, eating sandwiches by a gate (why weren't they racing?! ), with absolutely no idea what time they'd started the race. Worst moment: realizing we'd missed a last control because we were racing to the finish along with several other - very professional-looking - competitors who also sailed past it, and having to go back for it and then sprinting in on tired legs in order to avoid penalty points. Definitely an event to do again! From Jo Taylor ... Dave and I did this too. This was our best result to date, 8th mixed pair and breaking the 400 point barrier for the first time.